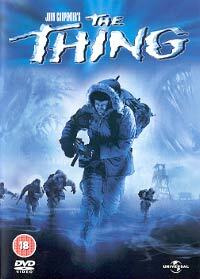 The Thing, together with Halloween and Escape From New York, make up my favourite (unrelated) Carpenter trilogy. This early '80s remake of the '50s alien B-movie gets a modern update, not only in the timeline, but also in the jacked-up special FX that took a sudden upsurge in that decade. The cold, boring existence of an American Antarctic weather base is ripped apart when a Scandinavian station's crew chases a dog into their territory. The men are killed, the dog saved and on investigating their camp they find it destroyed and evidence of an incredible find. It was an alien life form, and has now infiltrated their camp, slowly it starts to take over by using the men as host bodies - they're stuck with each other, unsure who may be friend or foe, the weather caging them together in a great piece of survival cinema. With such an incredible mood, excellent special FX and convincing performances, Carpenter more than improved the original material on which the early film was based. Russell is as cool as ever. Bottin's diverse, incredible, visceral, gross and creepy FX becomes one of the film's standout characters (especially the disembodied head which gets a life of its own!). DVD bonus features for this '80s classic include a making of documentary and commentary by Russell and Carpenter.